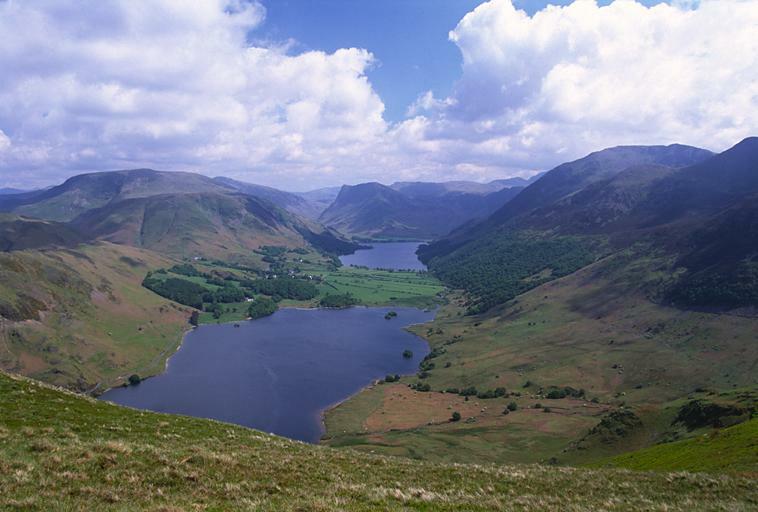 This is a fine view down Crummock Water and Buttermere. On the left , in the distance are White Side, Catstye Cam and Helvellyn. Robinson appears beyond High Snockrigg, its own spur. Dale Head is seen beyond Robinson's right flank and High Raise through the gap of Honister Hause. Honister Crag and Fleetwith Pike lie beyond Buttermere with Glaramara, Grey Knotts, Brandreth Green Gable and Great Gable to their right. High Stile and Red Pike complete the view. Smaller version of this picture.